The Honda Ridgeline is an ideal option for Michigan City and Merrillville drivers interested in a dependable pickup. The Ridgeline is versatile enough to be used for daily driving and tough jobs alike. Having made its first appearance in showrooms for 2006, the Ridgeline has remained the same dependable and versatile vehicle fans have come to love. Let’s see why. The 2006 Honda Ridgeline was offered in three different trim levels: RT, RTS, and RTL. A year later, the automaker added the RTX trim, which featured chrome accents. In 2009, Honda eliminated the RTX, and the Ridgeline underwent enhancements to its interior and exterior styling. The most recent version of the Ridgeline is relatively similar other than a new bold front grille and Sport trim level. The Ridgeline is now being offered in just a four-door body style. Drivers have four different trim levels to choose from, and each have a trunk that is hidden in the cargo bed. That hidden trunk also functions as an ice chest. Other impressive standard features include four-wheel independent suspension, a dent-proof bed liner, power-sliding rear window, and a trailer hitch. A unique trait of the Ridgeline is that it does not have a separate cab and bed. 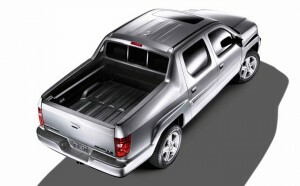 The pickup’s body connects the two elements. The Ridgeline only offers one powertrain option, a 250 hp V6 paired with a five-speed automatic transmission. The Ridgeline performs quite well in most driving situations and even delivers a smooth and quiet ride on the highway. Even though it’s a pickup, the Ridgeline works well as a sole family vehicle. Its comfortable cabin has plenty of room for passengers and cargo. With the Ridgeline drivers get the best of both worlds: sedan-like comfort and the spaciousness and strength of a truck. Although you may not have considered a pickup as an ideal family vehicle, the Honda Ridgeline is here to challenge that thought. Drivers in the Michigan City and Merrillville area should stop by Bosak Honda in Michigan City to see all that the Ridgeline has to offer. Once you have taken this vehicle for a spin, you won’t want to be without it.